Some of the beneficiary students receive Ceylinco Life Pranama scholarships from the Chief Guest Prof. Kapila Perera, Ceylinco Life Chairman R. Renganathan and the Company’s Managing Director Thushara Ranasinghe. The life insurance market leader’s 18th annual scholarships presentation saw Rs 12 million being disbursed to students that excelled at the Year 5 scholarship examination, the GCE Ordinary Level, the GCE Advanced Level and at the national or international level in sports, the arts or invention. It took the total number of students benefitted to date to 2,568, and the Company’s financial commitment to the programme to Rs 143 million. Ceylinco Life Managing Director and CEO Thushara Ranasinghe pointed out that while every Sri Lankan child has the right to free education thanks to the efforts of people like C. W. W. Kannangara, the reality today is that parents have to work extremely hard and spend large amounts of money to make their children winners, a fact that prompted Ceylinco Life to set aside part of its profits every year to provide Pranama scholarships to deserving students. 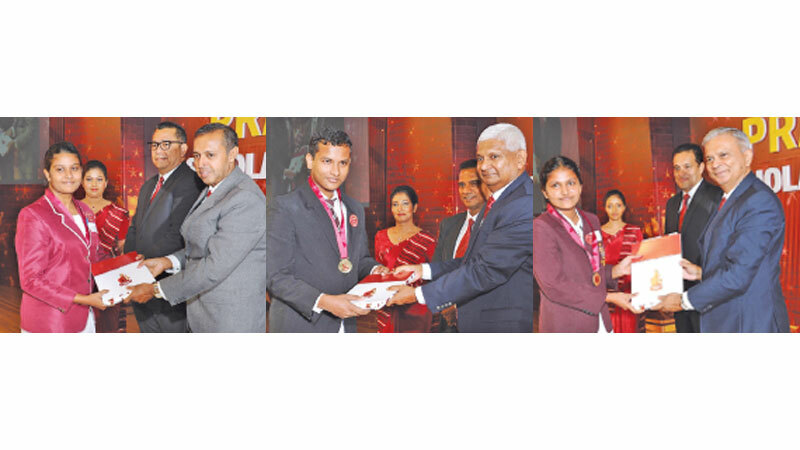 Emphasising that the love and security provided by family is invaluable, and that the responsibilities of parents extend far beyond the schooling of their children, Ranasinghe said the responsibility of the recipients of Pranama scholarships is to honour and look after their parents in their old age. Designated “tomorrow’s leaders” by Ceylinco Life, bright students from every district of the country, along with their parents and teachers, filled the main hall of the BMICH where the Pranama scholarships were presented on February 9.